Though Việt Nam U23 lost in the semi-final of the Asian Games, coach Park Hang-seo said he was proud of his players and that they will “grow up more after games like this”. Park’s charges lost to his native South Korea 1-3 at the Pakan Sari Stadium in Indonesia yesterday. “I felt that my players were afraid of their rival excessively in the early minutes, causing the early loss and then the next losses. However, I am proud of them and want to thank them for their dedication in the game today,” said Park. “The upcoming bronze medal is waiting for us and now we have to prepare for it in terms of psychology and physical strength. Today, my players were too tense so in the break, I told them to be more confident,” he continued. “We failed and of course, I am disappointed with this result but I believe that my players will grow up more after games like this,” Park added. Substitute Trần Minh Vương scored the only goal for Việt Nam in the 70th minute. “We had a difficult match with a strong rival. We made every effort but many of us didn’t have the best strength,” said Vương after the match. Việt Nam’s coach sent out a changed line-up from Monday’s extra-time victory over Syria, with midfielders Lương Xuân Trường, Phan Văn Đức and striker Nguyễn Anh Đức starting on Wednesday after serving as substitutes on Monday. After taking the field on Monday, defender Đoàn Văn Hậu did not play today. Việt Nam couldn’t get into the game early and allowed Lee Seung-woo to open the scoring via his left boot just seven minutes into the game. Things went to bad for worse for the Vietnamese, with Tottenham Hotspur star Son Heung Min threading the ball through to Hwang Ui-jo to slot past Việt Nam’s goalie Bùi Tiến Dũng to double the score in the 27th minute. It is Hwang’s ninth goal of the Asian Games. Coach Park switched things up soon after, bringing on midfielder Nguyễn Văn Quyết to replace defender Phạm Đức Huy. The substitution was almost a stroke of genius, but Quyết missed Việt Nam’s best chance in the 40th minute of the first half. 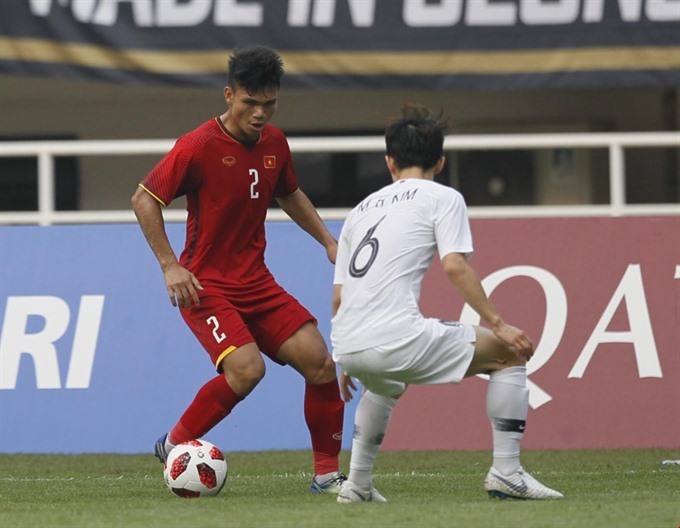 Việt Nam started the second half stronger, but couldn’t contain the rampant South Koreans, who capitalised on poor Vietnamese defending as Lee scored his second in the 55th minute to stretch the lead to 3-0. To their credit, Việt Nam refused to give up and began to assert themselves after the third goal, dominating possession and pinning their opponents back. Their efforts were rewarded in the 70th minute, as substitute Vương stepped up to curl a superb free-kick over the wall and past South Korean goalkeeper Song Bum-keun, sparking wild celebrations back home in Việt Nam. Six minutes later, missed a headed chance, and was promptly replaced by striker Nguyễn Công Phượng. With normal time nearly over, Phạm Xuân Mạnh should have scored Việt Nam’s second from a corner, but he fluffed his lines and could not beat Song. The full-time whistle sounded shortly afterward, ending the plucky Vietnamese team’s historic run. After the match, coach Park also sent his congratulations to South Korea team and his compatriot coach, Kim Hak-beom. Việt Nam will next meet United Arab Emirates who lost 0-1 to Japan in the other semi-final match played later yesterday in the bronze-medal match on Saturday.